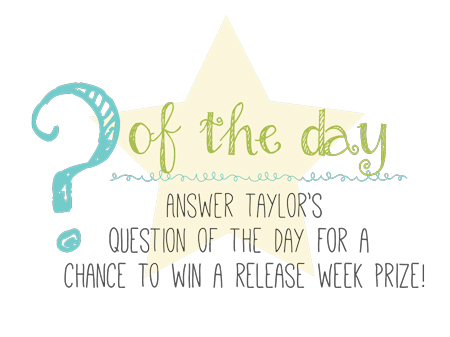 Welcome to Taylored Expressions June release! Today is day #1 of the sneak peek! Today I am showcasing two beautiful products with your. One is a gorgeous floral stamp set and coordinating die called Fresh Florals and a gorgeous embossing folder called Garden Party. I LOVE floral stamp sets and I cannot have enough of them to be honest. This one is gorgeous with stylized flowers and leaves. This set has coordinating dies for every stamp. That is so awesome. Great to layering. On my card, I have used the new Taylored Expressions inks to stamp the floral images to create my own background and also stamped and die cut for the focal point as well. 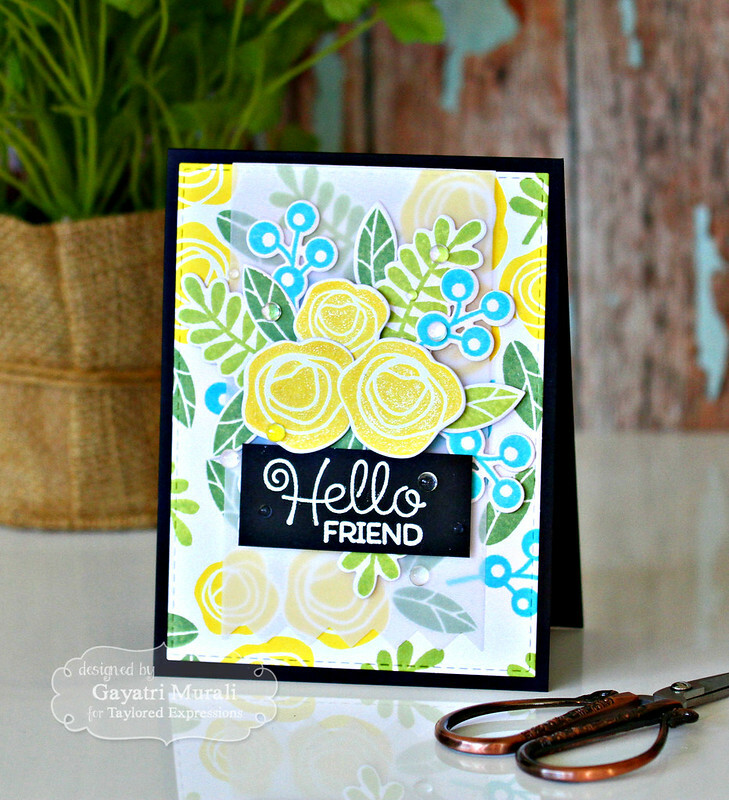 I have used Lemon Meringue, Cookie Monster, Peapod and Granny Smith to stamp the flowers and leaves from the Fresh Floral stamp set on Sugar Cube cardstock to create my stamped background. I then die cut this panel using the largest stitched rectangle die from Stitched Rectangle Stacklets. Since the background is very bright and busy, I added a layer of banner from Banner Stacklet 4 die set. For the focal point, I stamped the flowers and leaves using the same colour inks as the background and die cut them using the coordinating dies. I clustered glued them together. I added this cluster in the middle of the vellum banner.The sentiment also from Fresh Floral stamp set is white heat embossed on Oreo cardstock trip. The finished panel is adhered on Oreo card base. Embellished with clear droplets and flowers brushed with shimmer using Wink of Stella. 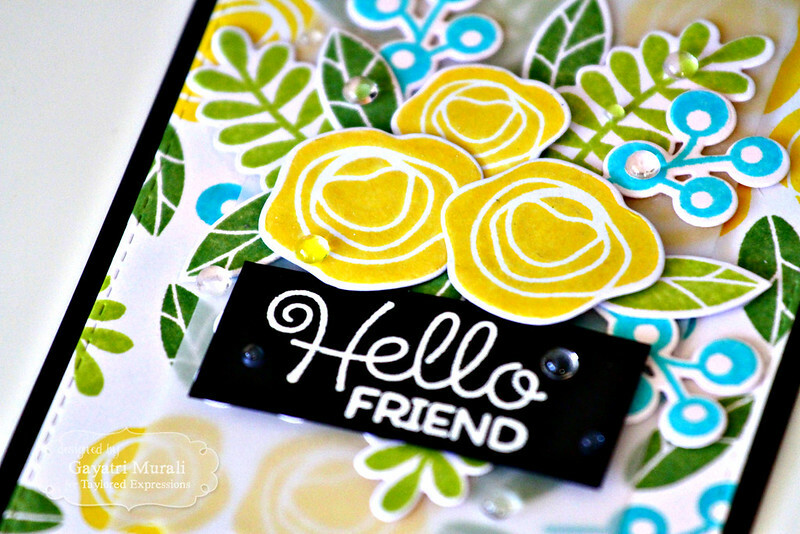 My second card showcase Garden Party embossing folder. I have embossed a Oreo cardstock panel using Garden Party embossing folder. Then I applied Deco Adhesive randomly using a brush and left the panel to dry. For the focal point, I die cut a smaller rectangle Oreo panel using the third largest rectangle die from Stitched Rectangle Stacklets. 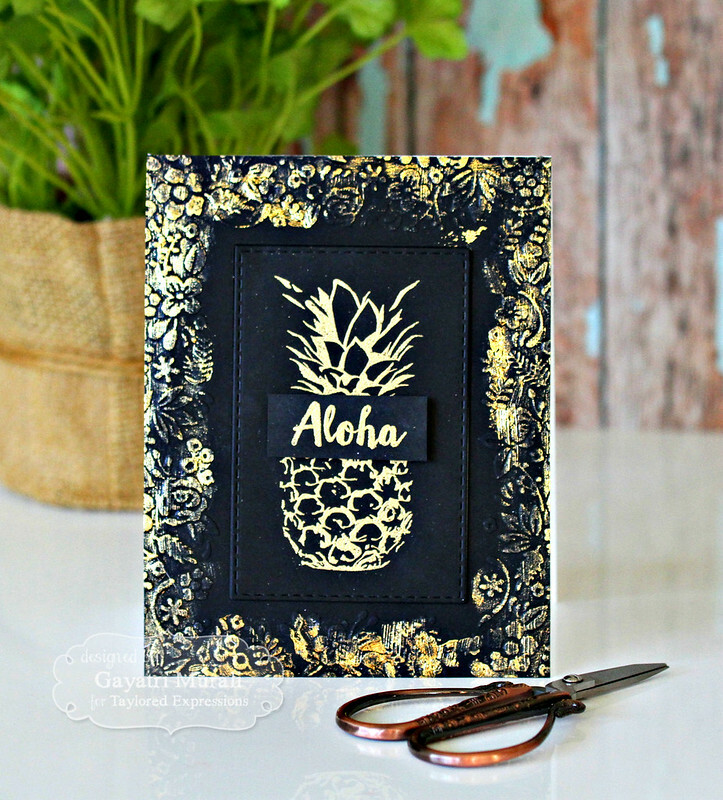 I have gold heat embossed the pineapple from another new stamp set called Simple Stamped Pineapple. 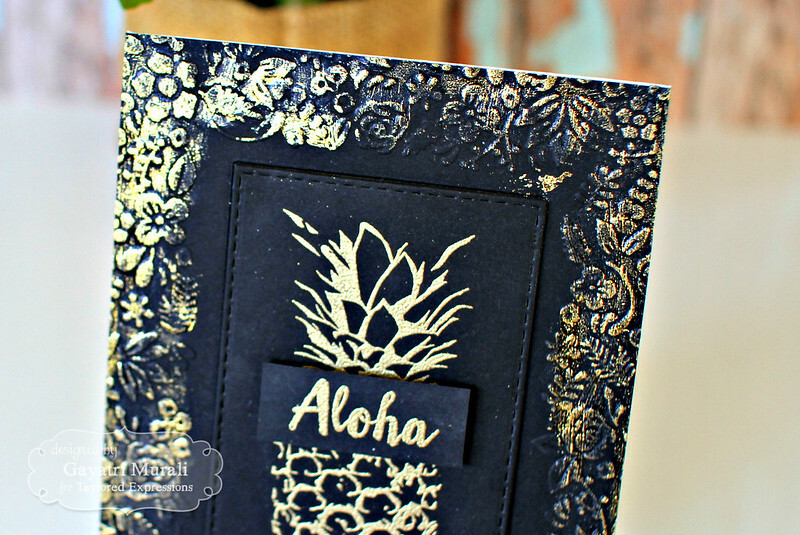 The sentiment is from Simple Stamped Pineapple stamp set also gold heat embossed on a strip of Oreo cardstock. When the glue on the embossed panel dried, I placed the Deco gold foil on the areas of dried glue and rubbed my fingers on it firmly. I then peeled the gold foil to reveal some of the foil stuck to the glued areas. The effect looks so cool. A bit antique looking don’t you think? I then foam adhered the focal panel in the centre of the embossed foiled panel. Adhered the entire panel to the card base. Gayatri, these are both fabulous! I love the first one with the sweet blooms and love how you've used them to make a lovely background! And the second one is fabulous with the gold foil. Love the idea of just using glue and rubbing it (no machine needed or Laser printer – yay!). And how wonderful to see you use it with the beautiful new embossing folder. And, yes, it does have an antique feel to it! Love it! Hugs!